This was the first day of our trek, and it was an eye opener. The bus ride through El Alto was amazing! I'm in love with the contrast between the crumbling street fronts and towering Neo-Andean high rises in downtown! Not to mention the outskirts of town, which resembled the movie sets of Mad Max. There was a worker-strike going on. People were throwing rocks and logs onto the road to make them impassible. We took back roads, and Diego had to jump out multiple times to move objects out of the way! After about a 3 hour drive across the vast Altiplano, we met up with our donkeys, burros, and horses at Laguna Khota and had lunch. There was one donkey, in particular, that was quite boisterous and we affectionately named it Delilah. Some of the beautiful horses assisting us on the trek. Erin-Leigh Hardy. The start of the hike was a bit tough for everyone. The trail climbed steeply up to a pass, and we all had trouble finding our breath. Richard set an easy pace, and we stopped about every 20 minutes for a break, which was welcomed. 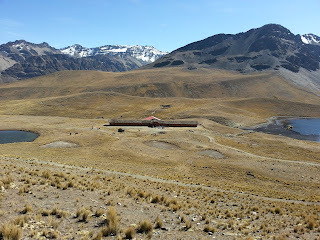 From the pass, we traversed through open country to Refugio Ajuañi, which is beautiful, colorful and huge! 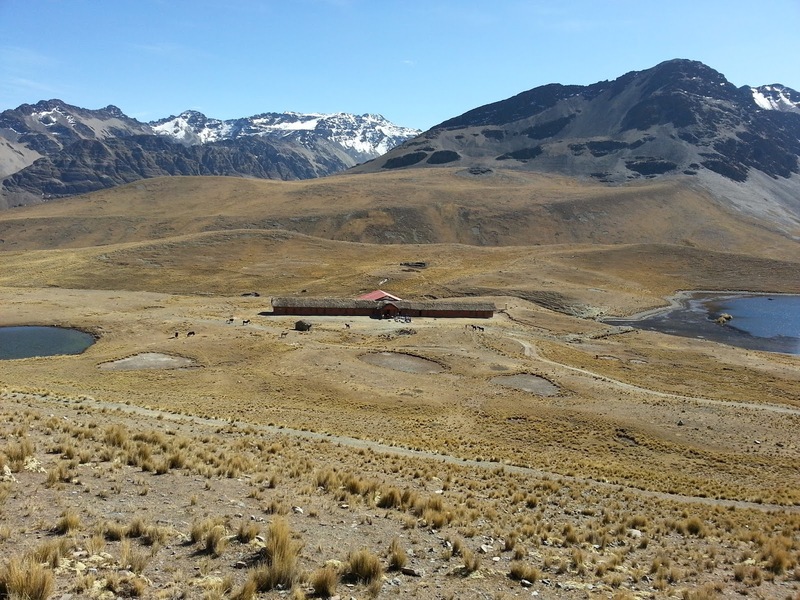 It was built in the 1980’s, the 'golden age of Bolivian tourism’, with the help of the government, but has since lost funding and is now kept up by a group of families. It is clear that there is much work to do to maintain a rural Refugio. We arrived at the Refugio at sunset. Much later, the burros arrived with the rest of our gear. They were delayed because one of the donkeys carrying our food slipped on the steep terrain and lost its load. It was dispersed on the scree and included our coca tea: a sacrifice to Pachamama, we all agreed. Once the animals arrived, we all napped until dinner. Dinner was amazing! Vegan soup followed by salad followed by ground beef with veggies! Our chef makes good use of herbs and spices and it was delicious. We ate so much! And we went to bed immediately following. Overall, more uphill, but not as strenuous. We woke up around 8:30 for breakfast and left the Refugio by 9:30. The terrain was very steep uphill followed by very steep downhill. 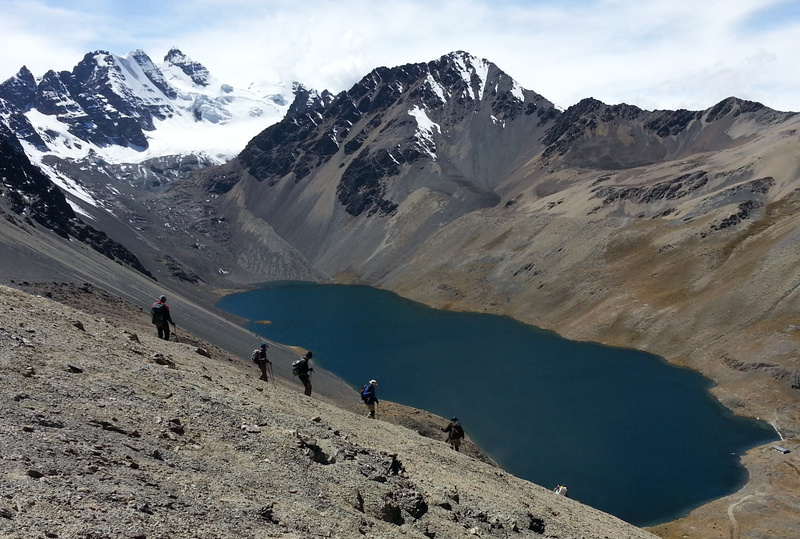 It took us about four hours to reach Laguna Cistiña. This area of land is run by two or three women. There is a lake and a beautiful waterfall surrounded by mountains. Ven asked to take a photo of one of the women. She agreed - for $5 each photo - but she was so tickled by me and my gear that she grabbed my trekking poles and only wanted to pose with Kate and I, “the women mountain climbers.” What an honor! Our team’s porters set up everyone's tent, which was very weird for me. The camp was setup with one kitchen tent and one dining tent, which made it so cozy in the 19-degree weather. 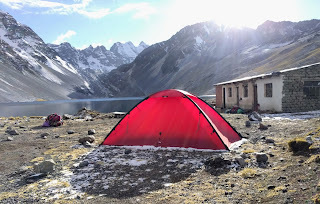 A glimpse of camp life at Laguna Cistiña from inside one of AAI's rental Hilleberg tents. Erin-Leigh Hardy. Over the night, most of the group started feeling slight effects of AMS (acute mountain sickness). Most of us took Diamox to get some relief. We learned a wonderful thing about Diamox...it does not mask your symptoms. Unlike pain killers that hide the pain without dealing with the underlying cause, Diamox actually heals your altitude headache! When you feel better, you are better. And we liked that. On the bright and light side, Hildago and the crew all dressed up in their fancy red coats to serve us breakfast. It was a welcomed reason to giggle. Once the sun was fully shining into the valley, offering some warmth, we packed up our gear and the porters packed up the tents. The hike began similar the first two days, steeply, but this time we made our own switch backs to make the climb more gradual. We paused for a break about every 20 minutes which allowed us to catch our bearings and take in the sights. As Bertus described, the mountains showed us their many moods throughout the day, and it was a wonderful new site each break. Two climbers enjoying the scene of the 'moody mountains'. Erin-Leigh Hardy. We then headed down to Refugio Juri Khota. The path was steep and loose, so we had great fun glissading down at triple the speed we hiked up the other side! 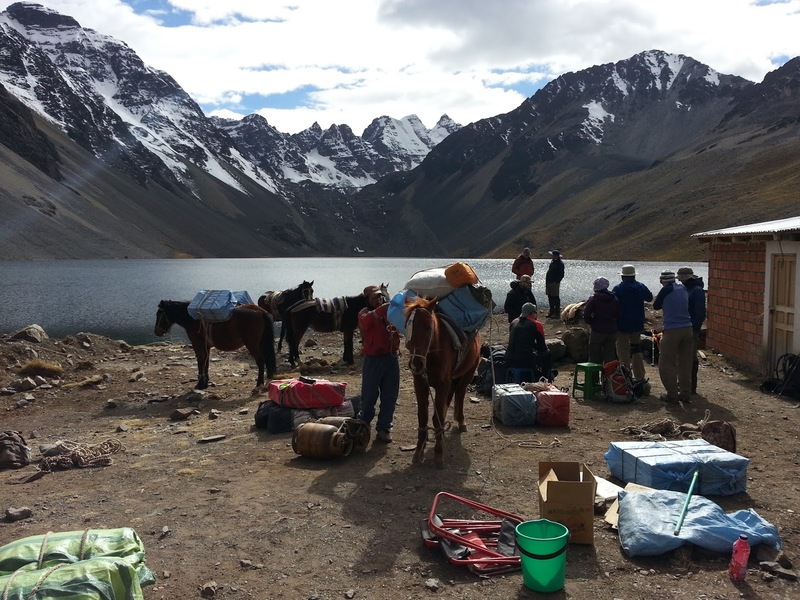 We arrived at the Refugio around 2 pm, and our burros and horses were right behind. We enjoyed a light lunch, including the 'miracle cocktail’ of peach and pear juice - perfect for any ruffled tummies! We had about a three-hour break between arrival and dinner. Some of the team explored the shores of Juri Khota and others (like me) took a siesta. Dinner was spectacular! Our chef made soup followed by chicken thighs. We were feeling quite a bit stronger. We had big appetites and there was very little was left over. Our scene upon arrival at Juri Khota. Erin-Leigh Hardy. We woke up around 8:30 to a light dusting of snow on the ground. We all ate a light breakfast and began to pack up. Waking up to snow and sunshine at Refugio Juri Khota. Erin-Leigh Hardy. 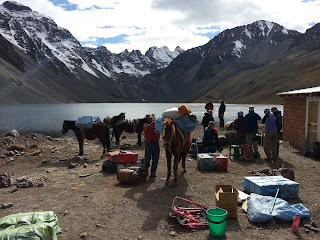 The mountain views on this trek have been great, and there was a nice passage of time this morning when most of us were sitting in the sunshine and admiring the lake and surrounding mountains, or getting up and playing with the donkeys. The hike out of the Refugio to Laguna Tuni was very pleasant. We were all much more acclimated and happy to be heading home to La Paz. We passed through another territory where we had to open (and later close) a fence to keep one owner’s llamas from trespassing onto another’s property. It was bizarre to see a fence in a place that seemed to be the middle of nowhere, but all the land in Bolivia is run by one community or another. Richard explained that our guides had a treat worked out that allowed us hikers to pass across this land. We paused for a good break when we first saw the Condoriri Massif. The spirits of the team soared! They are spectacular peaks. There was so much enthusiasm, so many pictures, and so many questions! It was very exciting. Packing up in the morning on the shore of Juri Khota with Cerros Wawanaki and Janchallani in the distance. Richard Riquelme. We reached the Refugio Tuni around 1 pm and were greeted by Diego and fresh pork chop meals from El Alto! The caretaker/owner of the refugio came out to greet us and offered us some of his hand made llama wool goods. We gratefully bought everything he offered; it was wonderful workmanship! The bus ride back was not interrupted by protest, but this time by a parade! Richard explained this was a parade to celebrate the sand which protects the outskirts cities of El Alto (I forget the names). It was such a sight to see everyone dressed in their finest along one of the dustiest roads on Earth!